Blackjack rules are not very difficult to learn, but you should not forget about the famous proverb here: it is better to see once than hear twice. What does it mean? It means that you can read a lot about the rules of blackjack card game, but you will not be able to use them and win the game without any practice. The strong advice here is to practice blackjack a bit before going to a land based casino and checking how good blackjack player you are. Blackjack is also called 21, and this is the maximum number of points you are allowed to have in order not to lose. Some players wrongly believe that their goal here is to get 21 points; it is not true: your goal at blackjack is to beat a dealer! Your task is to get more points than a casino dealer has but you should do it without exceeding 21 points. Remember: you do not play blackjack against other players who sit at the same blackjack table with you, so, forget about them! Beat a dealer! Place your bet at a special sector of blackjack table in front of you and remember the following fact: you have no right to touch chips or change your bet after the cards have been dealt. Note! Nominations of colors of chips may differ in different casinos. Blackjack can be played with 1-8 decks of 52 cards but usually 6 or 8 decks are used in casinos (Note! According to blackjack secrets, it is more profitable for a gambler to play blackjack with 6 decks of cards). HIT - ask for one more card if you see it will improve your result. STAND - ask for no more cards if you see that your result is enough for winning. SPLIT - if you have two cards of the same value (two 8's or two 6's for example) you have a right to split them and play with two hands now. But do not forget to make the same bet for your second hand. DOUBLE - it means that you double your bet and receive ONLY ONE more card. These 3 cards will be your final result. SURRENDER - it means that you decide to give up because you have bad cards and no chances for winning. You have 50% of your bet back in this case. 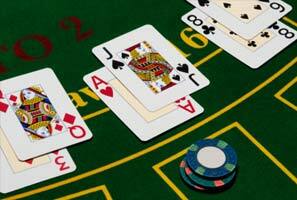 INSURANCE - this is the additional bet which is offered when a dealer has an Ace. If you are sure that a dealer will have Blackjack (21 points) you decide to "insure" your bet and add a half of it to your original bet. What do we have? If a dealer has blackjack, your half of bet is doubled and you receive your bet back; if a dealer does not have a blackjack, you lose your insurance and continue playing with your original bet.